Social media is the new frontier for advertisement wars and marketing campaigns. In 2017, social media ad spend is projected to be more than $41 billion. Any piece of media that becomes a sensation in a short time is viral content and such content can result in huge sales for a company. And as content marketers know, people don’t stumble upon a company’s content at random. 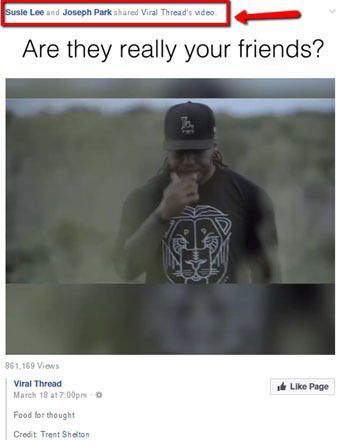 A potential consumer or viewer ends up on a company’s page because they saw it on social media or got a recommendation from a friend. Nearly 80% people say that social media is more important than other digital marketing strategies such as content creation, email, SEO and even websites. Social media has two categories, organic and paid. To understand what works best for business, let us look at their definitions first. Imagine you are at the grocery store and see a range of fruits and vegetables. Some are organic and some are not. What do you think of organic fruits and vegetables? You think that they are all natural, right? As your friends like and share the photo, the publisher’s reach grows organically to people who may not have heard of them. If you think viral content is generated organically, think again. A lot of time, effort, and thought goes into generating content that is hoped and intended to go viral. 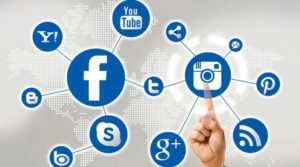 Organic social media uses free tools provided by each social network to build and interact with a social community by responding to customer comments and sharing posts. There are tools that companies can use to generate organic traffic. For example, Hootsuite and Buffer schedule and publish tweets on Twitter. Though you may need to pay for a license to use Hootsuite or Buffer, Twitter does not charge for publishing those tweets. Putting money behind your social media posts makes them paid social media. Facebook ads, LinkedIn ads, Stumbleupon ads, Twitter ads, YouTube ads, basically ads of any social media marketing channel come under the category of paid social media. 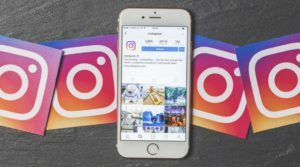 Regardless of the format, whether it is image, text, carousel or video, paying to display advertisements or sponsored messages to social network users comes under the category of paid social media marketing. Usually, the advertisements are based on targeted user profiles for example, age, locality, gender, occupation etc. The cost of advertising varies depending on the type of ad planned, such as cost per click (cpc). Why Does The Debate Exist? Social media marketing began with organic traffic. Take the example of the social media giant, Facebook. Initially, Facebook drove organic reach and audience engagement for free. Now you need to pay for it. 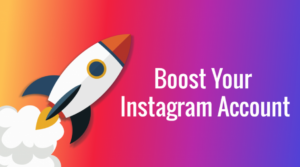 Businesses and brand pages need to pay to “boost” their messages to get into the newsfeeds of users. It can be argued that helpful, informative, and captivating, organic social content retains your customers. Using a mix of images, infographics, images, blog articles, video content, reviews and customer service, you can generate organic traffic. Paid social media nets in traffic while organic social media keeps them reeled in. However, it is paid social media marketing that actually gets results. Paid social ads result in higher Returns on Investment (ROI) because often organic content is not even viewed by the target community. On average, organic tweets reach only about 10% of followers while a Facebook page that has over a million likes has only about 2.27% as its rate of organic engagement. Why Should You Engage in The Debate? 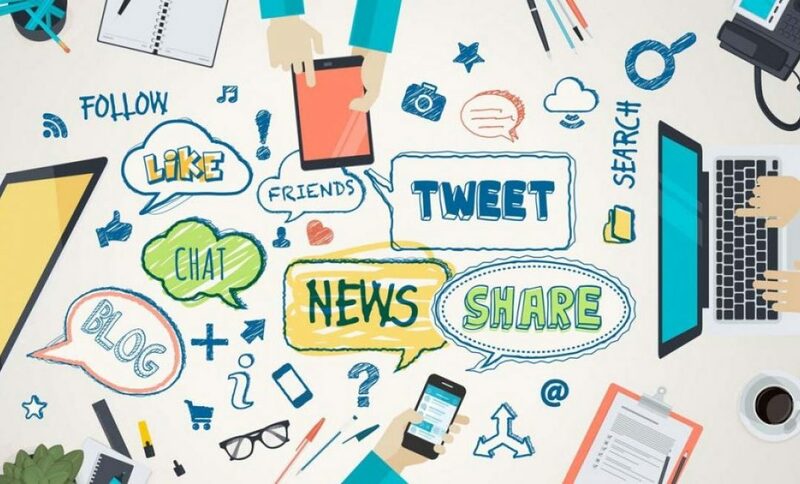 As a business, why is the debate between paid and organic social media important to you? In 2,000, the CEO of a small and struggling company that had a DVD-by-mail service approached the CEO of Blockbuster Video, John Antioco, with a suggestion about partnering up together. The proposal was that the DVD-by-mail-service would manage Blockbuster’s online rental business. Antioco dismissed the idea and turned down the suggestion of Reed Hastings whose tiny DVD-by-mail service was called Netflix. Blockbuster video no long exists while everyone has heard of $32.5 billion company that is Netflix. The reason why this story is narrated is because it has a very important moral. Blockbuster failed to recognize that the world around them was changing and they couldn’t foresee that a change in strategy is necessary. Looping back to our organic vs paid debate, you need to know which is more important and adjust your business accordingly to remain current and swim with the flow. Who Has Won The Debate And Why? Short answer: the stage belongs to paid social media. Organic reach is declining on all leading networks. Consider this statistic, over one-million pieces of content are shared every minute on Faceboook, however the average user misses 70% of his feed! In order to remain visible, companies have to prioritize paid social media otherwise their messages will be lost in the multitude of millions of other messages. By using your marketing budget for paid social media, you can reach out to a larger audience. Organic content gives you little control as to who sees it. On the other hand, paid strategies allow you to place your message front and center where there are people with whom you want to interact. For example, content placed on the Photoshop Facebook page is delivered to those who have already liked that page on Facebook. With a paid campaign, you can deliver that message to artists, photographers and creative types thus targeting a much more precise but wider audience all over Facebook. Retargeting is another asset of paid content. Retargeting allows social networks to bundle users that interact with paid content as part of its remarketing campaign. Thus, retargeting makes creating a conversion funnel easier by using a series of content that drives specific actions. For example, a user has read your article and now you would like him to download a whitepaper. 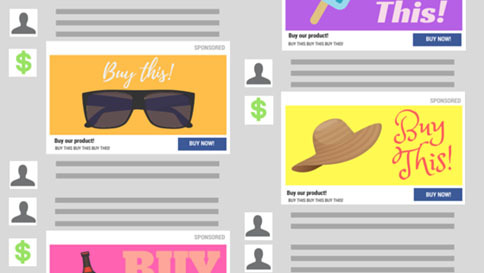 A retargeting campaign lets you view such functions anonymously as they occur whereas in organic content the interaction is often one time only. People buy from advertisements and offers on social media. A research made available by Crowdtap indicates that 64% of the 3,000 people surveyed used social media to find inspiration for shopping. Retailers that target consumers with deals and personalized offers on social media drive these figures. 46% of social media users are thinking about making a purchase when they use social platforms. And 40% of users actively decide what to buy based on the content they see on social media platforms which include recommendations and reviews. 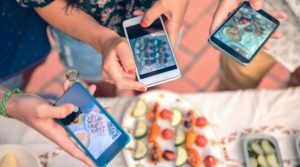 This trend of buying through social media is only expected to increase. 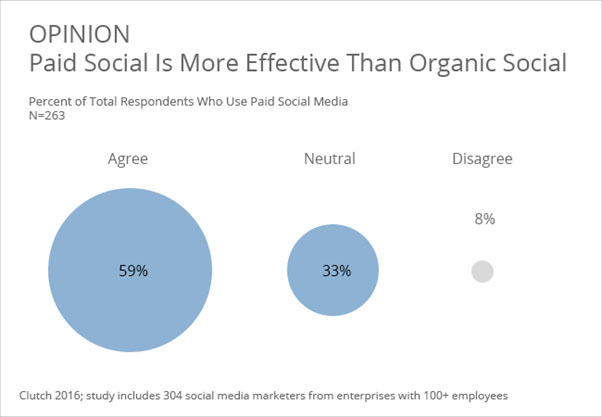 According to a Clutch survey, nearly 60% of marketers agree that paid social media marketing is more effective than organic. 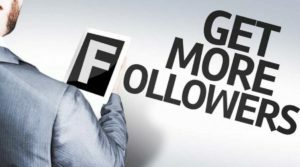 Paid social media puts appealing content in front of a targeted audience to convert potential customers quickly. It brings customers and potential consumers to a website or a social media profile which allows a company to show off its products and services and demonstrate its credibility. Another benefit of paid social media is the relative ease of tracking the efficiency of an ad campaign. 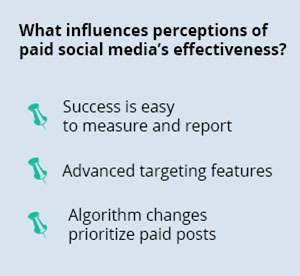 Perceptions of the effectiveness of paid social media campaigns are because of the measurable benefits a company accrues in the short term from their paid efforts. 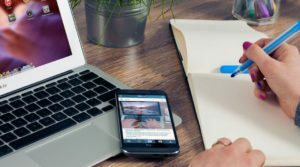 Sales, conversions, and click-through rates to a website are easier to measure and track than the longer-term-relationship-building tactics employed by organic social media campaigns. Based on online behavior, demographics, and interests, paid social media campaigns allows companies to target their audience effectively. 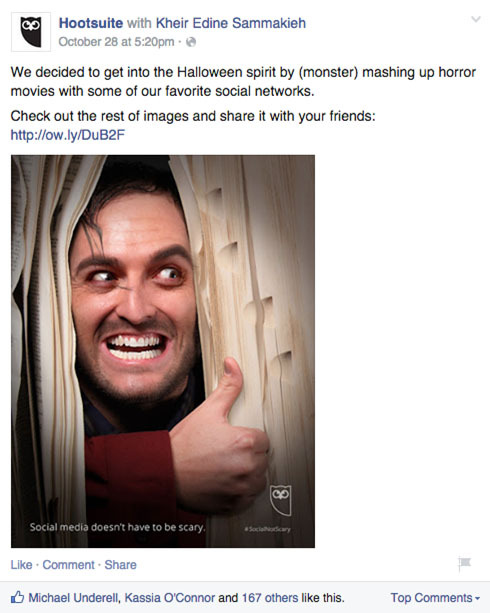 For example, the behemoth Facebook allows users to make custom audiences from an existing customer list. Companies can also use the Lookalike Audience feature with which new customers can be targeted who share profile similarities with existing customers. With a ton of platforms out there, knowing which channel to use for paid social media marketing is essential as well. Facebook leads as the social media channel preferred as per the Clutch survey with 66% of social media marketers opting to use Facebook. 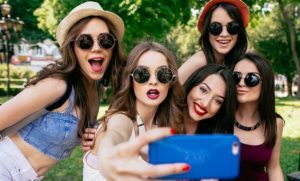 Other than having a huge user base, Facebook collects all kinds of data from its users’ demographics and psychographic profiles to location data, brand preferences, emoticon reaction data, facial recognition data, relationship statuses and the names of our kids, BFFs, cats, dogs, fish, hamsters and so on and so forth. And these insights are used in their advertising platform to serve its users relevant ads. 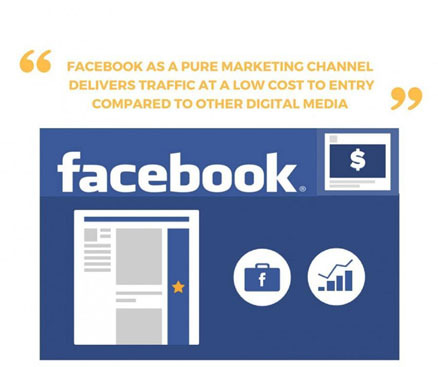 The cost to entry for boosting page posts or advertising is low as compared to some other digital media strategies. 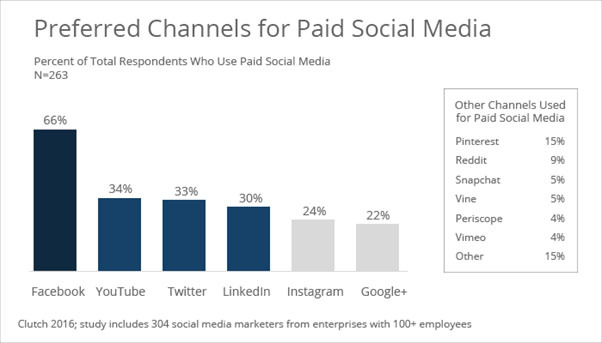 Youtube (34%), Twitter (33%) and LinkedIn (30%) are the preferred channels for paid social media after Facebook. 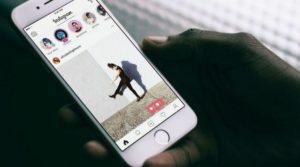 Others include Instagram, Google+, Pinterest, Reddit, Snapchat, Vine, Periscopes, and Vimeo. The debate between organic and paid social media is losing steam as a clear victor emerges. As the reach of organic social media declines, companies that don’t incorporate paid tactics strategically will be forced out of business. Steve Pearson of Friendemic explains it bluntly “A better solution for not being able to do paid social media is not to do any social media. Doing organic social with zero paid is a very inefficient use of resources. … You’re paying a lot to produce the content, but very few people are seeing it”.